KENNEDY SPACE CENTER, FL – After conducting a thorough review examining the feasibility of adding a two person crew to the first integrated launch of America’s new Space Launch System (SLS) megarocket and Orion capsule on a mission that would propel two astronauts to the Moon and back by late 2019, NASA nixed the proposal during a media briefing held Friday. The announcement to forgo adding crew to the flight dubbed Exploration Mission-1 (EM-1) was made by NASA acting Administrator Robert Lightfoot during a briefing with reporters on May 13. “We appreciate the opportunity to evaluate the possibility of this crewed flight,” said NASA acting Administrator Robert Lightfoot during the briefing. Although the outcome of the study determined that NASA could be “technically capable of launching crew on EM-1,” top agency leaders decided that there was too much additional cost and technical risk to accommodate and retire in the limited time span allowed. Lightfoot said it would cost in the range of $600 to $900 million to add the life support systems, display panels and other gear required to Orion and SLS in order to enable adding astronauts to EM-1. Thus NASA will continue implementing the current baseline plan for EM-1 that will eventually lead to deep space human exploration missions starting with the follow on EM-2 mission which will be crewed. At the request of the new Trump Administration in February, NASA initiated a comprehensive two month long study to determine the feasibility of converting the first integrated SLS/Orion flight from its baselined uncrewed mission to cislunar space into a crewed mission looping around the Moon. Had the crewed lunar SLS/Orion flight been approved it would have roughly coincided with the 50th anniversary the first human lunar landing by NASA astronauts Neil Armstrong and Buzz Aldrin during the Apollo 11 mission in July 1969. Instead NASA will keep to the agencies current flight plan. The first SLS/Orion crewed flight is slated for Exploration Mission-2 (EM-2) launching no earlier than 2021. If crew had been added to EM-1 it would have essentially adopted the mission profile currently planned for Orion EM-2. “If the agency decides to put crew on the first flight, the mission profile for Exploration Mission-2 would likely replace it, which is an approximately eight-day mission with a multi-translunar injection with a free return trajectory,” said NASA earlier. It would be similar to Apollo 8 and Apollo 13. 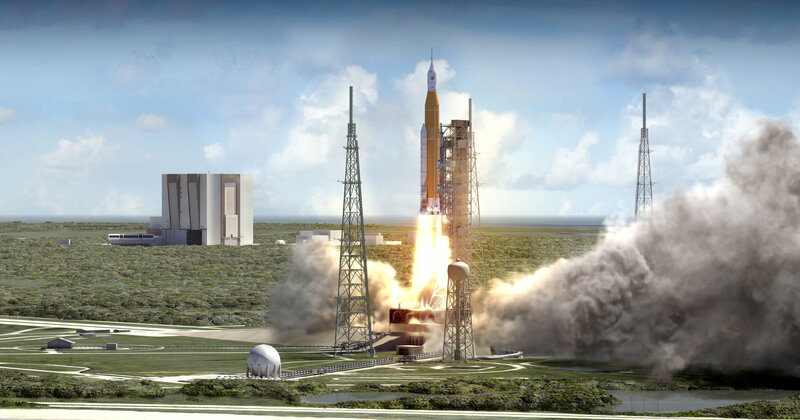 NASA is developing SLS and Orion for sending humans initially to cislunar space and eventually on a ‘Journey to Mars’ in the 2030s. They are but the first hardware elements required to carry out such an ambitious initiative. Sigh….just keep pushing the date back, NASA. “No earlier than 2021?” Geez. I miss the balls we once had for spaceflight. Under the current mindset, Apollo 8 wouldn’t have launched until at least 1985. Too risky otherwise. These postponements and delays have become so commonplace that sadly, the public doesn’t even notice anymore.